In all, Vichy's town center, where the story is set, is not much lager than 1,6 km (1 mi) from east to west and 3,5 km (2 mi) from north to south. So all the localities that appear in the novel are at walking distance from each other. That is exactly what happens. His daily strolls with Madame Maigret through town, during his cure, turn out to be a kind of framework in which the actual story is set. Very characteristic for Simenon is that he, apparently, maintains some of the authentic names of features like hotels or streets and on the other hand alters them. The Maigrets are staying in Hôtel de la Bérésina, in the Rue d'Auvergne. Hôtel de la Bérésina doesn't exist. Bérésina (Berezina) is, as far as we know, a river in Byelorussia where Napoleon Bonaparte in 1812 fought his famous losing battle. 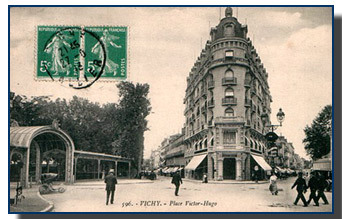 It maybe that the connection with Vichy eludes us and perhaps there has been a hotel of that name in Vichy in earlier times. The Rue d'Auvergne on the contrary, exists. It is situated in a quiet quarter in the south of the town, the Quartier de France. The Rue du Bourbonnais where Hélène Lange, the victim, used to live also exists to-day. It is a street in the same quarter as the Rue d'Auvergne, only two blocks away from where Maigret stayed. Reading about the murder in his morning newspaper, Maigret can't resist to go and take a look. The park where the police chief usually goes in the morning with Madame Maigret to watch the Jeu de Boules and to see the children playing (red arrows) is called the Parc des Bourins. 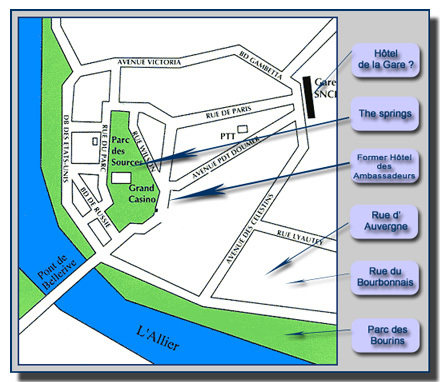 It is a park on the edge of the Allier river which, on that spot, is formed into a lake (Lac d'Allier) by a barrage. This particular morning Maigret turns right, instead of left, coming out of the hotel and walks by way of the Avenue J.-B. Bulot to the Rue du Bourbonnais where the residence of the victim is. Hélène Lange's sister Francine returns from her holiday on the Balearic Islands, because she's informed about Hélène's death. She and her lover find a room in the Hôtel de la Gare. Surprisingly, because in France there's a hotel with that name in even the smallest town or village, there is no Hôtel de la Gare in Vichy. Maybe there once was. 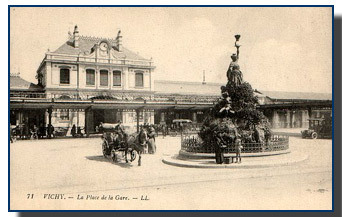 It is likely and obvious that, if there was a Hôtel de la Gare, it would have been situated in the vicinity of the train station. Louis Pélardeau, the manufacturer and businessman, who turns out to be the assassin of Hélène, stays with his wife in the Hôtel des Ambassadeurs, one of the sophisticated hotels in the city. To-day there are two 4**** hotels in Vichy, The Aletti Palace Hotel and the Sofitel Les Célestins. No Hôtel des Ambassadeurs. But there exists evidence of its existence. 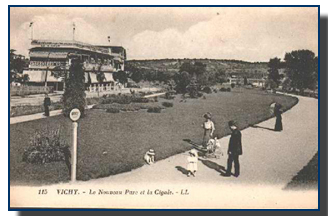 An old postcard shows the Hôtel des Ambassadeurs in Vichy. Maigret and Lecoeur can see the spectators coming out of the theatre while standing in front of the hotel. This means that it is located in the immediate vicinity of the casino and the theatre, which are next to each other, both on the Avenue du Casino. This is right next to the Parc des Sources where Maigret goes to "take the waters". - The Hôtel de la Bérésina where the Maigrets stay does not exist (anymore?) but the street where it is located, the Rue d'Auvergne, can be found in the Quartier de France. - The street where the victims home "Les Iris"(3) is located, the Rue du Bourbonnais, is only a few hundred meters away from Maigret's hotel. - The hotel where the victim's sister, Francine, stays, L'Hôtel de la Gare, does not exist, although the vicinity where it must be in the story, is easy to locate. 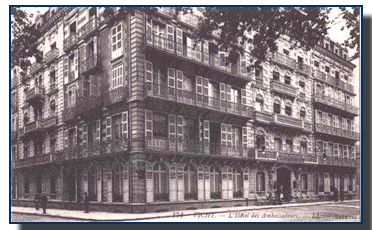 - The Hôtel des Ambassadeurs where the perpetrator is lodged did once exist It was close to the theatre building. - The Parc des Sources and the Hall des Sources where Maigret goes to drink the waters does obviously exist and is situated in the center of the city of Vichy. - Postcard Place Victor Hugo in Vichy, from: http://perso.wanadoo.fr/zeurg/index.htm#zeurg, website de Jean-François Gruez. - Sketch of the locality, G.de Croock. (3) Georges Simenon, Maigret à Vichy, Presses de la Cité, Paris, 1969, excerpts translated by G. de Croock. (4)Les Iris (Fr. ): The Irises.